FALIA REVIEWS: MSF (Motorcycle Safety Foundation) Basic Rider Course - I Passed!! MSF (Motorcycle Safety Foundation) Basic Rider Course - I Passed!! I passed!!! Not with flying colors, but I passed none-the-less. I now have my motorcycle endorsement and am legal to ride, on the road, by myself. You can bet I am just ITCHING to buy a motorcycle and am keeping my eye out on Craigslist... I really want a bike, but I still need lots and lots and lots of practice. I mean, really, how good can I be after only 8 hours of riding? I will try to share a little bit about the MSF Course I took this past weekend, but I am having trouble typing b/c I am wearing a brace on my right wrist. I sprained it today helping someone move a heavy hide-a-bed couch. THANKFULLY it happened the day after my riding test. I doubt I could have passed the course with a sprained wrist. I barely passed as it was, simply b/c I have performance issues when people watch me. I did way better on the practice rounds than I did on the final, one-shot attempts. Darn nerves. The MSF Basic Rider Course was a 3-day class and cost only $25.00. It teaches you how to ride a motorcycle, starting from square one, and they have them all over the country. The only previous riding experience I had was maybe 3 hours on a little 90cc dirtbike, so I was extremely nervous, and I seriously considered dropping out of the class even though I had pre-registered... but ultimately (thankfully), my fear was shadowed a bit by my strong desire to ride, and I became more and more excited to learn as the class weekend got closer. The first day of the course was in the evening, and it was all classroom learning. I felt immediately relieved because out of the 20 students, about 75% were females! Everyone got a copy of the MSF Basic Rider Handbook, and the class was split into 3 learning/discussion groups. Each group got to pick a name, so some chick in my group named us the "Speed Demonettes." lol. For the next 4 hours, we proceeded to read thru the Rider handbook, watch some videos, and answer a list of 126 study questions. The topics included: types of motorcyces, accepting risk, protective gear, pre-ride inspection, routine maintenance, motorcycle controls, range rules & hand signals, street strategies, common riding situations, braking, swerving, etc... It was information overload, and we went thru it all pretty fast... After only 4 hours, my brain felt fried. The instructor then split the class into 2 riding groups for the next 2 days (10 students per riding class). My group was supposed to meet bright and early at the airport parking lot at 8am... We were supposed to arrive 25 min early, and if we were late, we would be kicked-out of the class. It was a beautiful sunny morning, but my nerves were defintely present when I pulled into the airport parking lot and got suited up. We were instructed to wear long sleeves, long pants, full-fingered gloves, eye protection, a DOT approved helmet, and over-the-ankle boots. Most of the girls in my group were also beginners, but my stomach felt a little nauseous while we were all standing around waiting for the riding to begin. 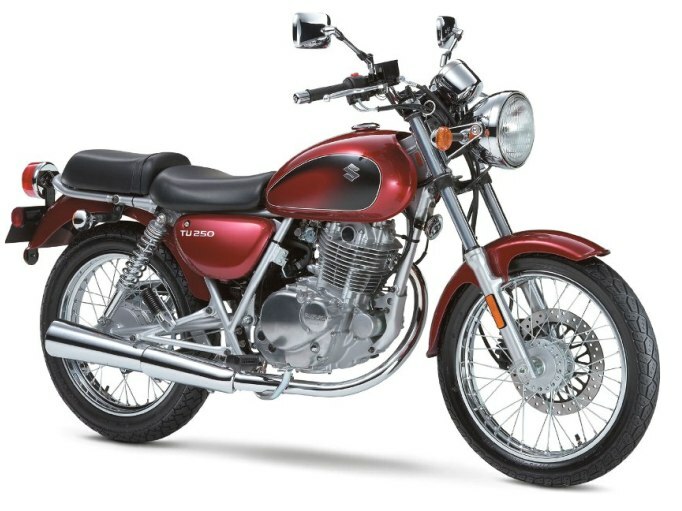 We were able to choose our own motorcycle out of about 10 different ones (dual sports, cruisers, and standard street motorcycles, mostly 250s), so I selected a standard Suzuki TU250X. It was such a new motorcycle that it didn't have a fuel valve or a choke, which made things easier for me I suppose. I picked it because it had a very low seat height (30.5 inches), I liked the burgundy/red color, and it just looked pretty darn slick. We all mounted our bikes, and man, 310 + pounds of weight felt like alot to have directly underneath me. The weight of the bike was pretty intimidating since I weigh about 115. Before starting the bikes, the 2 riding instructors had us find all the controls, and then we walked the bikes like 1/4 mile out to the airport riding area. It was a good workout for my hips, I could feel the burn! Then we finally started the bikes (side stand up, fuel valve to ON if you had one, turned the ignition key to ON, put it in Neutral, engine shut-off switch to ON, held in the clutch, and pushed the electric start button). We put them into 1st gear right away and spent a while just using the clutch in the friction zone to walk the bikes back and forth & then speed-walk them across the parking lot. Within minutes we were already riding back and forth across the lot, and then we were riding around in a single file line. It was a very fast paced class, but I will say that the Instructors were VERY nice and VERY good at explaining what to do. I only stalled my motorcycle twice on the first day :) One instructor said that the most stalls in a row (during one of his classes) was 37! Yikes. I would've been beyond embarrassed. We did a lot of practicing in our 4 hours of ride time on Saturday. We were doing quick stops, weaving in and out of cones (just pressing on the handlebars, not actually turning them), going around curves (slow before the curve, look where you want to go, press the handlebar in the direction you want to go, roll on the throttle) and also physically turning the handlebars to maneuver thru slow-speed off-set cones. Overall I did pretty good on day one. I got complimented on my quick stops and was used as a positive example for my head turns for looking thru the curves. It was a day of extreme concentration... the most mentally exhausting day I had experienced in a very very long time (perhaps ever). It was fun, challenging, scary, and exhilerating, all at the same time. After the Saturday practice rididng, we all met back in the classroom to take the 50 question multiple choice test, based around the 126 study questions we had gone thru on Friday. It was a very easy test. I got 100%, along with almost everyone else in the class. The hardest part was still yet to come. Scoring - You got points for anything you did wrong. Points = bad. You could get a maximum of 15 points and still pass, but if you got 16 points you would fail. You got points for things like not going the correct speed, going out of boundary lines, putting your feet down, stallling, failure to turn your head, failure to upshift or downshift, failure to stop quick enough, etc. Points could add up quickly... The only automatic failures were to either lay-down your bike OR to do something dangerous. We could only do each exercise one time for the final evaluation. 1. two U-turns in the tiny box. Although I did pretty darn perfect in practice (one guy who had been riding since 1983 was worried I would do it better than him on the test! ), I BOMBED it on the test. I have performance issues with people watching me, and my clutch hand cramped up in the middle of it. I quickly released the clutch while I had the throttle up and lurched right out of the box and put my feet down. I will just call the whole exercise ugly. I got 8 points right off the bat. Not a good way to start the test. Surprisingly, I calmed down a bit. Doing so bad at first made me basically say F*ck it. I laughed at the fact that I did so bad and shrugged it off. I honestly knew I could do better, but one attempt was one attempt. Moving on. 2. High-speed swerve. The swerve actually took place directly after coming out of the messed-up figure-eight. After pulling out of the U-turn box, I had to quickly get into 2nd gear, speed up, swerve right between some cones (press right, then press left), and stop using both brakes & downshift at the same time. I did it perfectly even though I was still flustered from the figure-eight. Zero points gained on that. 3. Quick-stop. This was frustrating b/c I did this 95% perfect every time in practice. I have no idea why I stopped a foot too-far during the testing. Probably my nerves. 2 points gained for a not-fast-enough stop. 4. Cornering exercise. Although I turned my head properly, shifted properly, didn't go out of bounds, and I didn't run over any cones, I got 5 points for not going fast enough in the curve. That was honestly a surprise to me b/c I thought I was going fast enough. And isn't going too slow better than going too fast anyway? Regardless, I got a total of 15 points. SO close to the border between pass and fail. I was relieved to pass, but also really hard on myself at first for being so close to failing until I realized a couple things..
1. I did way better in practice than I did on the test, and yet I still passed. 2. How often will I be doing a tiny figure-eight on a motorcycle in real life? A U-turn, yes, but a little figure eight withoug putting my feet down? Probably not a whole lot. The people in the class who had been riding for YEARS had trouble doing it. Plus, if I had done the figure-eight as decent as I had in practice, I would have only had 7 points total instead of 15. 3. I was a beginner rider! How good was I seriously supposed to be after only 8 hours of ride time? I honestly am still having a hard time believing that I took this course, did all this stuff on a motorcycle, and passed. My entire class passed! (well, except one girl who was extremely timid and just couldn't get the hang of it). It feels like a whirl-wind that I am so happy/proud to have accomplished. I just know that I need to get a motorcycle soon so that I don't forget what I've learned. Taking this class was well worth all the stress, fear, and nervousness, and I would recommend it to anyone. I think these courses are pretty much exactly the same all over the country, you just look for them at http://www.msf-usa.org/. I have fully discovered that there is nothing like being on a motorcycle, and there is this new excitement erupting within me. I even met a girl in the class who I really meshed well with, so we programmed eachother into our phones as "biker buddy." I don't know quite how it is possible, but somehow I feel like a new person. More free from fear, capable of doing anything that I really put my heart and mind into. Good on yah! What kind of motorcycle are you looking to get? You've just accomplished one of the items on my bucket list. The course is offered at the university where I work and go to school, but it's $175. It's just not in the budget right now, but soon. I want a bike, too, and I think taking the course would be the best way to set those wheels in motion, pun intended. Awesome for ya!! I'm glad to hear you took the course! I took it myself about 4 months ago and since then found an old bike, but in good shape, on Craigslist for $600! I've been getting a lot of miles in. Riding twisty roads on a small nimble machine, leaning into the turns like a fighter jet, feels transcendent, like getting away with something. I hope you find a great bike! Something that fits you and does exactly what you want. Manywheelsbrian.blogspot.com ->Bri has a small honduh enduro that he hauls on the back of his astro based chinook pretty easily. Maybe he could give you some good ideas on carrying one on the VW. If I remember right, he made his carrier. Can't wait to see what you end up buying! YEAH! Now that you can ride legal-like, get out there and have fun. Shorty's first bike was a Kawasaki KZ250 that she rode everywhere. She put about six thousand miles on the bike that summer/fall. She now rides a Suzuki Boulevard S50 (800cc). We've been all kinds of places together. Have such a good time and enjoy your time in the saddle. Ride safe: remember its always the other guy you have to watch out for on a motorcycle. Ok I'm a complete stranger and this will probably come off creepy but.. I came across your post while googling something else... Anyway. I have to say it struck a chord with me. I passed my basic rider course on August 4th and reading your post was like reliving the whole experience. lol. You only paid how much!?!?!? My BRC cost me $350 in the Bronx, NY. A few things I did differently. I am a pressure person so I couldn't get the figure 8 for the life of me 6 times in practice (I was all over the place... having never been on a bike before). Go figure, on the test I did it perfect with no trouble. - I didn't downshift completely till I completed the high speed stop (right before putting my left foot down)-- Something I never did in class/practice. - Thank goodness the cornering exercise went smoothly for me, I think I was running low on a margin for error. Only 6 out of 12 in my class passed. Many of the others failed mostly for going too slow, despite given opportunities for a second attempt at the exercises, they didn't speed up at all. I shared your sentiments on slower being safer and was curious enough to ask my rider coaches about that when learning of the people who didn't pass. I was given this little tidbit of info on that. Paraphrasing "The problem with going too slow is, it often reflects that the rider is afraid of the bike, the speed and isn't confident in his/her ability to control it's capabilities. If you aren't in control of the bike, then the bike is in control of you. It can take you into a dangerous situation and you'd be along for a dangerous ride." It kind of made sense and I will say it has even become a mantra for me, whenever I get on my bike. "Control the bike, don't let the bike control you." I'm still disappointed however, to see some of my classmates fail after having bonded over the course of the class. One in particular was a man named Peter, who just turned 70 last November. I really wanted him to pass and told him that I hope that if ever reach his age, I had the gumption to take on the challenge like he did. I've rambled on, but before I go, I'll tell you the other rule thumb I was reminded of this past weekend. Be safe, but always remember to have fun and keep your face in the wind (Chin up, eyes high). I've been practicing in empty lots with my own little cones, etc. on the weekends. It wasn't my day this past Saturday and being a little impatient... I let it get to me. So I spent too much time looking down and worrying on the things scattered about the lot, the bike and my mistakes and not enough on riding. I went into a low speed turn; the bike started to buck and lurch... I tried to throttle out and down we went, lowside. I shot my leg out and caught most of her, but 400lbs tipping was too much to keep vertical on one leg. 20$ for a broken blinker and another 40 for a pair of replacement pegs (only snapped one, but they only sell pairs.) Next time, I'll hit the cutoff switch for free.- I was googling prices, crash cages and trying to find out what the bucking and "lurching" thing was all about, when I came a cross your post. Anyway. Its good to hear about the other MSF graduates out there, their experiences and people that share my sentiment "there is nothing like being on a motorcycle...", as you've put it so appropriately. It's so much harder to describe to people in words and experiences than it is to so easily capture it by saying theres nothing like it. I feel it every time I start in first and cycle up through the gears as I tear down one end of the lot... feeling like my Buell and I are about to sprout wings and take off.. right before I reach the end. P.S. You might also want to look into joining the American Motorcyclist Association. They fight to keep the rights of people everywhere that live for that feeling. Also, for some of the memberships they offer roadside assistance in case god for bid you breakdown somewhere and don't know anyone with a pick up or a trailer. Congratulations on passing the course! Anyway, put 1 foot down on the U-Turn and went too slow on the cornering as well. I actually bought an old Honda Rebel 250 for $900 on CL a week before. It needs minor work. New front tire, filter and a rear brake adjustment. It also had low miles considering its age...guy kept garaged. I would recommend that you go to some local Motorcycle stores and check out the used bikes. Sit in them, feel the weight, check out the styles, etc...Have FUN riding and Stay Safe!!! Great one! You will have a blast riding and NOTHING is cheaper on gas, but you must be extra diligent on a bike and realize people are used to looking for bigger things on the roads, cars and trucks, and sometimes will not see a small person on a motorcycle and pull right out into you, so be alert at all times and a bit extra cautious and you'll have so much fun with the air in your face! Enjoy! Way to go!!! I knew you would love it. I just traded in my first bike for a new 2007 Nomad and love it. Get a bike that you are comfortable with and you will have a blast. Too bad you are not closer to me, we could go for a ride once you get a bike! That's really cool that you passed and I'm sure that your bike skills will get better with time and practice. Congrats! Do you worry about your safety, or is the risk worth it for you? All my friends who ride have been hit at least once, or have wiped out. Fortunately they are still alive, but it has definitely kept me off a motor bike! My biggest concern if I ever rode would be losing a limb, or becoming a vegetable. I just stumbled across your blog, and Ahh! It's just nice to knowing there is interesting people out there. As far as motorcycles go, I learned on a VERY worn out '74 CB400, since then, I've driven and owned several other bikes, but I've always held onto this one. So many fond memories exploring the country side on those long summer days. Marke - I'm interested to see what doors this opens for me, too :) good to hear from you! Wayne - I want a dual sport, preferably a Yamaha. Specifically, I'm wanting an XT225. White. lol. Bret - thanks you! that is great that you've been getting so many miles in right away. and what a great deal on the bike! Stay safe and remember to be aware at all times. That is what I will keep focusing on. Paying complete attention. Nick - yeah, the class was pretty intense. They aren't messing around, they want to make SURE you know what you are doing before they pass you. You've been riding 20 yrs without a motorcycle license? ha. that is awesome. You outlaw, you. Mike - thank you! hey and thanks for Brian's link, for some reason it seems familiar to me but I can't remember why. I will bookmark it and perhaps send him a message. Guntard - nice! I googled the KZ250 and it looks like a great bike. I can't wait to finally get a motorcycle and get more comfortable with riding. I will definitely be riding defensively. J_Undisputed - THANK YOU for posting about your class experience! I loved reading it from someone else's perspective. I wonder why I didn't get a 2nd chance when I went too slow. Maybe b/c it was the final exercise and I had already just-barely passed? Also that makes perfect sense what you said about being in control of the bike and being comfortable with higher speed. I think I will use that as my mantra too. Always be in the control of the bike. Don't let it control you. You know, that is where fear tends to come from. People are afraid of what they cannot control. Once you know how to control something, there is no reason to be afraid of it. :) Hope you are getting lots of practice! I haven't ridden since the class and that freaks me out a little b/c I don't want to forget what I learned or get too rusty at riding.. anyhow, you be safe! also thx for mentioning the American Motorcyclist Association. I will google it. sungineer - wow, i am surprised everyone else's class was so much more expensive. i wonder why the local one here was only 25 bucks. thanks for your comment and glad to hear you passed your course too! richard - yeah, safety is the big thing with motorcycles.. I want a white bike to go with my white helmet. Perhaps I will wear bright yellow or orange or red when I ride. I want to be visible!! Freely Living Life - thank you! eye4media - safety is my FIRST concern when it comes to motorcycles. But FUN is right up there, too, and I'm not going to NOT ride b/c I am afraid of all that could happen. I am going to be safe, resonsible, defensive, and in control, while having fun on a motorcycle. Sure it is dangerous, but the enjoyment of riding is worth the risk. I may end up riding more off-road or on trails b/c riding on the road might be too scary, but I don't know yet. I'm just starting out. If I'm uncomfortable on the road b/c of how risky it seems, then I will just dink around in the woods. We will see. Isaac - nice! thanks for the comment! I'm not sure if I'd want a bike that old since I'm not very mechanically inclined. I would probably be better off with something a litter newer. I don't mind kick starting though, and I do like the look/feel of older bikes. I'm excited to ride. I just need a bike that runs. lol. Basic riding course is necessary as practise makes a man perfect so initial step is mandatory, safety is also essential. I came across your blog through your Youtube videos on concealed carry. When I learned you lived out of a van, I immediately thought you would love the simple pleasure of living off of a motorcycle for a while. :-) There's nothing simpler then having everything you need on the back of your bike. My foray into that arena was a 5560 mile trip in August 2010 through all 10 western states. My bike of choice was an 06 FZ1 with my tent, sleeping bag, clothes, and handgun all packed on the back. There is truly nothing like the coastal highway in California and Oregon! If you decide to ride out west, though, keep a few things in mind. Most of the coastal states are decidedly anti-self-protection so you can't carry, however you're allowed to be armed in your home and generally your tent counts (even though your car/bike doesn't). Don't ever ride through Death Valley in the summer during daylight. Trust me. Be prepared to get cold and wet along the Oregon coast regardless of the time of year. I now live in Raleigh, NC so this summer will be the east coast trip. If you have any questions on motorcycles, gear, handgun laws, great roads, or decent campsites, let me know. I took the MSF Course called Riders's edge through the Harley dealership here. I actually ordered my bike through overseas military sales. If you are overseas on orders you get MASSIVE discounts on vehicles that are American Made. Basically I was able to get a 20000 harley for 15K. I was apprehensive about what type of bike to get as I had no experience other than dirt bikes on the tundra of Alaska. The bike was built for me at the factory and shipped to the dealership here in Georgia. When I got home, I showed up at the dealership and started the MSF Class. The class was awesome! My best old army buddy went through with me. He had no experience and was the best in the class by the end of the week. It was easy to pick up the skills needed to ride, but the biggest problem I had was breaking the habit of always wanting to look over the handlebars instead of orienting my head and eyes through the turn. I started riding my bike, 2012 Harley FXDF (Fat Bob) black denim Paint, and had no issues with the size of the bike or the power of the 103 cubic inch motor. Im happy I got what I wanted instead of starting with a sportster and risking dissatisfaction. In the first 6 months on the bike I logged over 10K miles. Thats the best thing about living in Georgia. The riding season is all year. In Alaska you can get maybe 2 or 3 months and thats all. Last December, I woke up one morning, got on the bike and didnt stop until I hit the Gulf of Mexico. And I did it all in a t-shirt!! Giving up my freedom for 10 years sucked. But I think being on 2 wheels has really helped me get it back. Redbeard - nice! I won't be getting a bike for quite a while yet, but I've always wanted a little Yamaha XT-225 to mess around on.